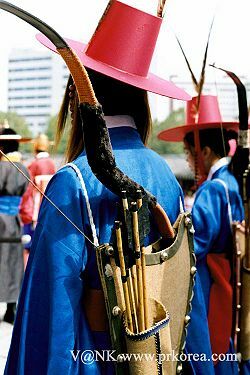 During the Goryeo and Joseon dynasties of Korea, the royal courts conducted gwageo (or kwago), the national civil service examinations. Typically quite demanding, these tests measured candidates knowledge of the Chinese classics, and sometimes also of technical subjects. Gwageo served as the primary route to secure positions in the government or military. Based on the civil service examinations of imperial China, the gwageo first appeared in Unified Silla, gained importance in Goryeo, and became the centerpiece of education in the Joseon Dynasty. The tutelage provided at the hyanggyo, seowon, and Seonggyungwan was aimed primarily at preparing students for the Gwageo and their subsequent career in government. Under Joseon law, children of officials of the second full rank or higher only enjoyed high office automatically; other candidates had to pass the Gwageo. Those who passed the higher literary examination came to monopolize all of the dynasty's high positions of state. The Gwageo was devised as a way of ensuring that the most qualified, best prepared men ruled the country. Study of the Confucian classics marked the first step toward preparing for government office beginning in the Unified Silla dynasty. Limited to the True Bone and Hallow Bone aristocratic classes, Silla set the tradition that continued through Goryeo and Joseon dynasties. Although Joseon originally established the Gwageo so anyone could take the test, before long only yangban of the highest order could sit for the examination. The kingdom of Silla administered the first national examinations in beginning in 788, at the suggestion of Confucian scholar Choe Chi-won. Silla's entrenched bone rank system dictated that appointments on the basis of birth negated the benefit of passing the examination. Under the Goryeo dynasty, the national examinations became more systematic and powerful than they had been under Silla. Still, they remained only one among several avenues to power. A man who had reached a position of the fifth rank or higher could automatically have one son placed in a position of rank. The examinations, established in the reign of Gwangjong, served as a means of breaking the hold that a few powerful families held over the government. Throughout the dynasty, the examinations strengthened the throne against the aristocracy. That also took the form of aligning the throne with the provincial elites, and the kings of Goryeo strove to extend educational opportunities to the local elites throughout the country. Any member of the yangin freeborn class had permission to take the examination, although the throne excluded the descendants of monks, criminals, and cheonmin. Over time, government-run educational institutions, such as the hyanggyo and Gukjagam, lost ground to private institutions like the Twelve Assemblies. The major examinations tested knowledge of the literary, coming in two forms: A composition test (jesul eop), and a test of classical knowledge (myeonggyeong eop). The royal court officially held those tests every three years, but had discretion to hold them at other times as well. The composition test became more prestigious, and its successful applicants divided into three grades. Successful candidates on the classical examination received no rank. In the course of the dynasty, some 6000 men passed the composition examination, while only about 450 passed the classics examination. The Goryeo royal court revised the classics examination in 1344, under the reign of Chunghye, on the model of the examination system then employed in Yuan Dynasty China. The earlier system based directly on the classics was replaced with one based on Neo-Confucian interpretations of the classics. Yejong, and laterGongyang just before the dynasty's fall, offered military examinations briefly. For most of the dynasty, military examinations and educational paths to military rank did not exist. This may have reflected the strength of the military elites during that period. The courtoffered examinations (jabeop) in a variety of fields, including Buddhism. Monks who passed then received a special clerical title, beginning with daeseon, or "monk designate." The government administered separate tests for the Seon and Gyo sects, which dominated the Buddhism of the Goryeo period. Under the Joseon Dynasty (1392-1910), the examinations fell under three broad categories: The literary examinations (mun-gwa), military examinations (mugwa), and miscellaneous examinations (japgwa) covering topics such as medicine, geography, astronomy, and translation. As other roads to advancement closed, the gwageo became virtually the only pathway to a position of rank. Strict criteria governed who could take which examinations. Only yangban could sit for the literary examination; by that means, the yangban secured a hold over most positions of state. When writing the examination, candidates had to record the names and positions of their four great-grandfathers. Only those who already held a position of rank, or who had already passed the lower examination, could take the higher literary examination. 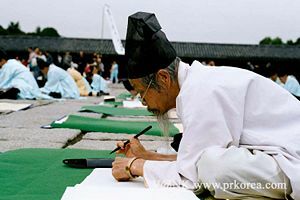 The yangban looked down upon the examinations generally restricted to the jungin class of hereditary technical workers. Over time, even members of the lowest class (the cheonmin) could take the military examination. The gwageo provided a basis for regionalism. Due to the strength of regional factions in [[Joseon Dynasty] politics, scholars from out-of-favor factions often did not bother to take the examination at all. In addition, the government forbid many of the candidates from Hamgyong to take the gwageo. In the late Joseon Dynasty, an increasing percentage of successful candidates came from the northern province of Pyongan, and the small county of Chŏngju came to produce more successful candidates than any other county. The royal court originally administered the gwageo (known as the singnyeonsi 식년시) every three years. 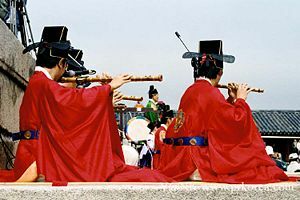 As the singnyeonsi became less important over time, an increasing percentage of candidates took the gwageo on special occasions. 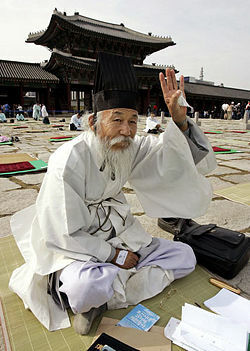 Those included the alseongsi (visitation examinations) administered when the king visited the Shrine of Confucius at the Seonggyungwan royal academy, the jeunggwangsi (augmented examinations) held during national celebrations, and the byeolsi (special examinations) held on other special occasions. The government usually limited those special examinations to the literary and military examinations. 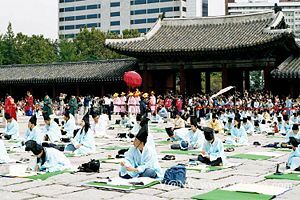 Over the course of the Joseon dynasty, the royal court held a total of 581 irregular examinations in comparison to 163 of the triennial singneonsi examinations. The court administered the literary and military examinations in three stages: An initial qualifying test (chosi) administered in the provinces, a second examination (hoesi) conducted in the capital (to determine the candidates qualifying for the the jeonsi), and a third examination (jeonsi) in the presence of the king, resulting in a ranking in order of candidates. Each stage had a prescribed, norm-referenced, number of successful applicants. The candidate who received the highest score (jangwon) in the literary examination won a post of the 6th junior (jong) rank. If the jangwon already held a position of rank, he elevated four levels. The miscellaneous examinations had only the first two stages; their candidates either passed or failed without ranking. Testing procedures served as a frequent flash point of controversy, with factions vying for control of the nature of the examination. In particular, the question of whether the first phase of the higher examination should be oral or written became a hot topic of debate in early Joseon. The literary examination divided into a lower and higher examination. In turn, in the lower literary examination some candidates applied for a "classics licentiate" (or saengwon) and others for a "literary licentiate" (or jinsa). After passing those lower examinations (saengjin-gwa), they proceeded to the higher examination. That lower examination may have originated in the entrance examinations for the Gukjagam of Goryeo. In the lower examination, the literary licentiate tested compositional skill in a wide variety of forms of Chinese poetry and prose, including shih poetry, fu rhyming prose, piao documentary prose, and ts'e problem-essays. The classics licentiate tested knowledge of the Four Books and Five Classics from an orthodox Neo-Confucian interpretation. From each regular administration of the test, a total of 100 successful candidates moved on for each licentiate, entering a pool of candidates. From a pool of 600 (for each licentiate), the government selected 200 from the capital and 400 apportioned from the provinces. The court administered the higher literary examination every three years, selecting a total of thirty three successful candidates selected from a pool of 240. Of those 240, Seonggyungwan sent fifty, the capital forty, and the Eight Provinces (the number sent from each province varied, with Hwanghae and Yeongan sending only ten while Gyeongsang sent thirty). Each of the first two of the higher examination divided into three parts: In the first section, the candidates showed their understanding of the Confucian canon, in the second part they demonstrated their ability to compose in various literary forms, and in the last portion they wrote a problem-essay intended to show their political aptitude. Over the course of the Joseon Dynasty, a total of 14,620 men passed the literary examination. The triennial singneonsi passed roughly 41 percent of those; the remainder passed in the course of irregular examinations. That proportion shifted over time; as the dynasty progressed, the irregular examinations became increasingly important. That may, in part, have been because of the fixed number of candidates in triennial examinations and the flexible number of candidates in the irregular examinations. The military examination selected 190 candidates in the first stage, of whom 28 passed to the second stage. Of those, seventy came from the capital and the remainder from the various provinces, with Gyeongsang contributing thirty, Chungcheong and Jeolla contributing twenty-five, and the remaining provinces ten candidates each. The military examinations tested a mixture of military and literary criteria. The first stage of the test presented a practical test of a variety of military skills. The second stage, out of which the successful applicants came, an oral examination tested the applicants' knowledge of the Confucian canon and certain classics of military thought. The third stage, determining the candidates ranking, again tested practical military skills. The miscellaneous examinations, or japgwa, divided into four parts: translation, medicine, natural science (for example, astrology and geography), and mathematics. The government office employed specialists in the field, closely connected to the Sahak royal technical academies, to oversee the examinations. In the case of translation, the examinations covered the four languages used by the Joseon court: Contemporary Chinese, Mongolian, Jurchen/Manchu, and Japanese. The Office of Translators, which maintained translators in the capital and in the major border-ports and cities, oversaw that examination. At the first level, forty five candidates in spoken Chinese and four in each of the other languages moved on. The Office of Translators selected thirteen applicants in Chinese and two in each of the other languages in the second level. The medical examination selected eighteen finalists, narrowing to nine successful applicants in the second round. Those nine won positions in the Bureau of Medicine, some placed in the palace and others in each provincial division down to the hyeon level. Those who passed the japgwa received a crimson certificate, the same color obtained by those who passed the literary examination. Pressure from the yangban eventually changed that color to white, signifying a lower level of achievement and entitling the bearer to a position of lower rank. In the reign of Jungjong of Joseon (1506-1544), the gwageo expanded to include a supplement at the suggestion of the high official Jo Gwang-jo, called an "examination for the learned and the virtuous" (hyeollanggwa). The king presided over the hyeollanggwa. Local magistrates recommended the candidates as men of the highest integrity. The gwageo system became increasingly corrupt in the later years of the Joseon Dynasty. Scholars unable to pass the examination began to form a class of disaffected yangban; the early nineteenth century rebel leader Hong Gyeong-nae notable among those. Many of the later Silhak scholars also turned away from state service. The court of King Gojong finally abolished the gwageo with the Gabo Reforms of 1894, along with legal class discrimination and the old rank system. The tradition continues in the form of university entrance examinations and civil service examinations in modern-day South Korea. ↑ Hanguk gyoyuksa, p. 108. ↑ Hanguk gyoyuksa, p. 63-64. ↑ Yi (1984), p. 104-105. ↑ Yi (1984), p. 129. ↑ Hanguk gyoyuksa, p. 63. ↑ Yi (1984), p. 118. ↑ Yi (1984), p. 133. ↑ Byeon (1996), p. 277-278. ↑ Yi (1984), p. 219. ↑ Yi (1984), p. 181. ↑ Byeon (1999), p. 278. ↑ Hanguk gyoyuksa, p. 109. ↑ Yi (1984), p. 180. ↑ Hanguk gyoyuksa, loc. cit. ↑ Hanguk gyoyuksa, p. 112. ↑ Hanguk gyoyuksa, p. 110. ↑ Hanguk gyoyuksa, p. 110-111. ↑ Hanguk gyoyuksa, p. 111. ↑ Yi (1984), p. 205. ↑ Yi (1984), p. 254. ↑ Yi (1984), p. 291. Sei Moon Sa. 1952. Ko Tun Ko Si Kuk Sa Moon Je Jip (Examination in Korean History for Government Employees). Seoul: Sei Moon Co.
Song, June-Ho. 1969. The Korean Government Service Examination Rosters. Salt Lake City: Genealogical Society of Utah. This page was last modified on 24 January 2014, at 16:29.